"30 Books Everyone Should Read Before Their Thirty". Because I am quickly closing in on that looming age, I decided to take a look at their list to see what I could find. 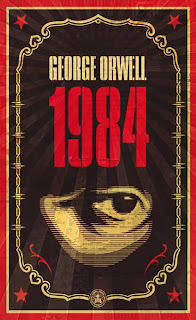 I discovered that I agreed with most of their choices, which included some of my all time favorites; "1984" and "A Catcher In The Rye," to name a few. I strongly recommend you take a look at this list of great books! Since the main reason I looked at this post was because of the urgency in its title, I thought I would share some advice about why I think this is so. I once had a professor that said a young persons mind is like clay, it can easily be molded and changed by the opinions of its surrounding, sometimes into something completely opposite of what it once believed. However, also like clay, when its starts getting older and exposed to the world over time (usually in its mid-30s), it starts to harden and resist change, becoming set in its opinions no matter what evidence is laid before it. This is what I think the authors of this post were trying to get across and why they gave such urgency on reading these books as soon and as young as possible. The younger you are, the more of a chance that these great books will shape your opinions of the world and not just be heard.